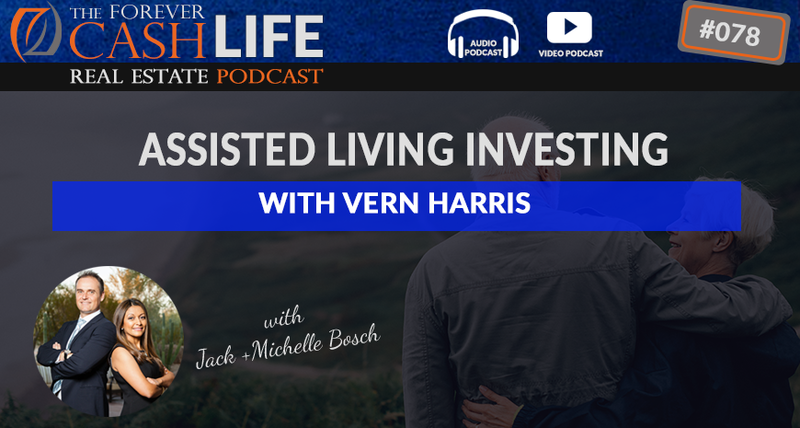 Vern Harris specializes is an interesting form of real estate investing – he transforms properties into assisted living facilities. Many people assume that in order to do this you have to invest many millions into a gigantic property with hundreds of rooms – this simply isn’t true. In this episode you’ll hear how Vern transforms houses into facilities that gross over $40 000 a month! And the best part is, these facilities are a lot more personal, therefore giving its occupants an amazing standard of living. Learn more about this unique niche in this episode of The Forever Cash Podcast! Jack: Hello, everyone. This Jack Bosch speaking. And welcome to the latest show of the Forever Cash Real Estate Investing podcast. Your host, just myself, Jack Bosch, with landprofitgenerator.com. I’m super excited to have you here. Our guest today, we are going to talk about assisted living, investment in assisted living. Basically, a lot of the behind the scenes, a lot of the really big players are reorienting their game towards that space. So it’s definitely something you want to learn about, particularly also because it’s one of these, kind of, niches, that I say in the best sense of the word, weird niches, like land flipping, right? And we have one of our guys here that is an expert in that area, owns several of them, and we’re gonna introduce him in just a second. Before we do go, though, as always, make sure you leave us a five-star review if you enjoy the episode. If you don’t, don’t say anything, right? But if you enjoy it, a five-star review. Go on iTunes, check the five-star box or whatever it is, and then leave us a little blurb on there. Share with us what you enjoy about the podcast. And that helps us spread the word and get more things out there, get more listeners to this podcast. Also, if you’re watching this on YouTube, make sure you go below, put the thumbs up, ask a question, share it with others so we can, again, spread the word. So with that, we’ll get started in just a second. Announcer: Welcome to the Forever Cash Life Real Estate Investing Podcast with your hosts, Jack and Michelle Bosch. Together, let’s uncover the secrets to building true wealth through real estate and living a purpose-driven life. Jack: So Hello, Jack Bosch here again. Welcome to the Forever Cash Real Estate podcast. Our guest today, I’m excited, is Vern. Vern, wonderful. I’m super excited to have you here today. We are going to jump into… I didn’t say your last name, Vern Harris, of course. We have met before and we’re on, obviously, a first name basis here. Our guest is Vern Harris. And Vern, you are, obviously in your car right now as you can see in the video. If you are in audio, you don’t see that. I know you just came out of a meeting. I appreciate you making time for us. Tell us a little bit about yourself and about your background and how did you get into assisted living investing? Vern: Okay. Well, my background is I’ve been an entrepreneur pretty much since ’87, a completely different industry. Got involved in the real estate investing about five years ago. And when I first got involved in investing, it was interesting. My mom said, “Hey, I’d like to invest in assisted living.” So I’m kind of an education nut. So I go through a lot of education, go to a lot of classes and that type of thing. And there was a class that came through with assisted living. So I was first to sign up for that. It really intrigued me because it’s a combination of a business and real estate. And with my business background, that to, me was very attractive. So I got involved with that and shortly thereafter, I got my real estate license and started helping people buy and sell these assisted living facilities. And I’ve been doing that for about two and a half years now. I run a group of people, investors, that are interested in this space and we try to educate them and help them get into this space. And that’s kind of how I got involved with this. Jack: But you own assisted living yourself too now, right? Vern: Yes. I’ve got personal interests in one house that we are leasing out and the company that I work with, A Better Way Realty, we currently own 12 of these things that we do triple net leases too. Jack: Okay. So now let’s jump right into that. So here’s the first thing you heard. You have a house. When people hear assisted living facilities, they think, like, down the road in Phoenix, on one of the interstates, right next to it, there used to be a hotel. We actually did seminars in that hotel. The last time I drove by, it’s like 15 miles away from here. The last time I drove by I was like, “What is that?” It’s no longer the XYZ hotel. Now it’s a big assisted living facility with something like 150 rooms. And it makes sense. A hotel, each room has their own bathroom. Each room has the water. It’s all hooked up and so on. And plus they have a big kitchen and a big dining room. And so it’s a big place for like 150 people to live in there, or perhaps even 300. I don’t know how many rooms they have, but probably, at least, let’s say 200 rooms or so. So there’s assisted living for 200 rooms. This is not what we’re talking about. You’re talking about taking a house and making an assisted living facility. So that is interesting. So that seems to be much more accessible for the regular budget because I’m sure that assisted living facility over there cost many millions of dollars plus many millions of dollars of renovation and marketing and so on, to fill it up, versus a house, making it ready is probably not a multimillion-dollar project, right? Vern: Correct. Probably, on average, by the time we’re all said and done, if you were to start from scratch in our market, a decent house is $600,000. We’re talking about a pretty good sized ranch, maybe 3000-and-up, square feet. Jack: And which market are you in? Vern: I’m in the Denver market. And then you’re going to put in probably $100,000 to $150,000 of remodeling in that. A good chunk of that, probably $40 to $50 grand, is in a fire suppression system, sprinklers basically. There are some modifications sometimes to the doors, some ADA things that you have to do. The bathrooms are the other big part. And then we want to add bedrooms. So a lot of times it’s a garage conversion or adding in some walls, something along those lines. Ideally, we’d like to have at least 8 to 10 bedrooms in a house and as many as 16 bedrooms. But usually, when we get up to that number, it’s gonna be a new build that will fit better. Jack: That makes sense. So you’re taking a 3,000, 4,000-square-foot house, you’re converting the garages. Yes, because if it’s assisted living, usually the tenants don’t drive anymore, right? Jack: So you can take the garage and convert it into more bedrooms. You can also take, perhaps, a large bedroom and convert that, put a hallway in and then make it into smaller bedrooms. Is that what you do? Vern: Yes. You can do something like that. You can take maybe a den or an office and convert it. You know, there’s a lot of spaces in a big house like that that you can add some bedrooms. Jack: Typically, does every one of these bedrooms have to have their own bathroom or how’s the relation to bathrooms or is the ratio on that end? Vern: Well, by law, you have to have at least a one bathroom per six residents. But if you have a bathroom and a bedroom, you’re going to get about 500 bucks a month additional rent out of that particular space. So it makes sense if you can to add them in. It might cost you five grand to put it in, but you’ll get that return in one year. Jack: Ten months, yeah, absolutely. That’s exciting. So now that sounds good. So you found a house that has the right configuration, perhaps there’s a two or three-car garage that you can turn into bedrooms just to have…you take an office and turn it into a bedroom. You take the large master and turn it into two bedrooms. And perhaps it has three other bedrooms anyway already. So now we’re at like three, six, eight, let’s say, nine bedrooms, for the house at this point. Is that a feasible number? Vern: Yes, it is. And in our state, 10 is kind of a sweet spot. When you get over 10 beds in a house, then you need to have an additional caregiver. So, you know, the other half of this is that you’re actually giving care-giving to these residents. So that’s the part of the business that’s the operations business side. So you’re really giving them help with their…what they call the daily activities of living: so eating, dressing, sometimes toileting, if they need that kind of care. And it varies depending on what their level-of-care needs are. So you wouldn’t want to go over 10 people for one caregiver. Now that’s an expense. So 10 is kind of a sweet spot so you don’t have to bring in another employee. Jack: Right. Okay, very cool. So now walk me through the scenario. Before you walk me through that, I’ll ask that question in a moment. But right now is, so this is the real estate side, getting the house ready. Now the operations side of things is what probably scares most people because they don’t know what the legal, what the laws are, what you have to do in order to care is like, are you running these? Are you hiring the nurses and the caregivers and marketing the properties and filling them up or how do you end up making this a profitable endeavor that also helps the wellbeing of the people there? Vern: Okay. So we do not do that part, but somebody could, and it’s not that difficult because it’s like any other business. It is a challenging business like any business, but it’s pretty profitable too. The average in Denver for a private-pay bed is $4,200 a month. So you have 10 bedrooms in a house, then your gross income is going to be $42,000 a month. Jack: All right. Now that probably caught a bunch of people’s attention right now. So $42,000 a month on a, let’s say, make it $40,000, $40,000 on a 9 or 10 bedroom place. Let’s walk through two scenarios. If you do not want to do the business part of it yourself, you are the real estate investor. You want to find a house. You want to get it ready. Who do you rent it out to? Who is like the main leasing person that… What are some companies that would come in and rent a place like that and then do the business operations side of that? Vern: You’re looking for small operators of these things. Your best client is somebody who’s already doing it and is looking to expand their operations. The whole business works better in multiples, what we would call a three-pack because usually, it requires an administrator. So that’s someone who’s at the top kind of running things. And that person could be getting paid anywhere from $40 to $80 grand a year depending on their level of how good they are and how many they’re running. So you take that big expense and you spread it over three facilities or four facilities. Your cost-per-facility goes down. Of course, your profits go up. So you’re looking for somebody out there who is doing this already and knows what they’re doing and wants to expand their operations. Jack: Okay. That makes sense. Now, how much do they pay you in rent on a place like that if they take over the operations? Vern: It varies, but we’re probably seeing anywhere from $6,000 to $8,000 a month on a triple net lease. Jack: Okay, $6,000 to $8,000 a month. Okay. In that case, it makes sense to buy a $600,000 property, put $150,000 in it, because you’re basically getting about a 12% cash-on-cash and you still get your depreciation and so on, 12% to 15% cash-on-cash. That’s not bad. Now if you run this yourself, obviously, then you own a business now. But now you’re getting the $42,000, which is $480,000 a year and you now pay…yes, you have to pay utilities, you have to…which, of course, are heightened with 10 people living there. You have to pay any kind of, perhaps, other expensive services. You have to have the caretaker and all these, kind of, things. What are the typical expense ratio of a place like that if you run it yourself? Vern: We’re seeing typically about $20,000 to $24,000 a month to operate. Jack: What’s the levy, about $16,000 to $18,000, $16,000 to $20,000 as a net on a…? Vern: Right. And that’s going to be before your debt service or before your lease. So, you know, if you’re running a tight ship, and you’re doing it at $22,000, you’ve got $20 grand left to play with. If your debt service is $8 grand, then you still have what, $14 grand somewhere net range of net profits. Jack: Right. How much? Fourteen, okay. Yeah, so 14 times 12 again is…what is that? $168,000, or something like that on one facility. That sounds like a good moneymaker for people. Now, it sounds like a good opportunity. Of course, it comes with the work involved and so on. And also it comes with what comes with older people. I mean, people also die in those places and people need to…and things happen and emergencies happen. So it’s not just, “Hey, just go put them with the caretaker.” It’s a business that you’re dealing with, with older people and their families and all their…everything that comes with it. So it’s certainly something that you want to think about well before you want to get into. But from a profitability point of view, it sounds very attractive. Vern: Yes. Yes, it is. And you’re right. You’ve described all of the things that we see in this business that, you know, for me, make me want to stay on the real estate side. I don’t handle the people dying very well. And it is, unfortunately, a part of life. But, you know, the people that I see operate these things just have hearts of gold, and, you know, they’re just absolutely wonderful people and they really enjoy what they’re doing. I think you have to if you’re gonna be doing this and taking care of somebody’s mother or grandmother. Jack: Absolutely. Yeah. Great. So this is interesting because now, let’s say, as an investor, you can come across a property that you can do this with. You can qualify for the loan. You can qualify for the extension, or you perhaps get somebody to partner up with you, a money partner, to put these things together. Then you rent it out. I mean, you still get, not the $20,000 they’re after, but $12,000, $14,000, but, you get the $6,000 to $8,000 rent on a place like that, which is actually very nice and probably substantially more than you would get just by renting it out to a family. Jack: Well. So it’s a way to double your income, more than double your income. Six to eight is like two to two-and-a-half times your income on that rental house. That is very attractive. Now, a couple of questions, and that is, where do people… $4,200 a month is a lot of money. What does the typical tenant there look like? Somebody under social security with $2,000 cannot afford this. So who is moving into these units at $4,200 or $4,500 a month on average?? Vern: Your average resident is probably 80 to 83 years old, 75% or 80% of them are female and their money basically comes from, maybe a home or retirement or something along those lines. Keep in mind they’re toward the end of their life. So, you know, everything that they’ve accumulated throughout those years is what they’re using to live on for this period that, you know, most of them finish out their life in these homes or go on to, if they need to, they go to skilled nursing homes or a hospice. But a good portion of them actually live there. The average that they live there is about three years. So again, keep in mind they’re toward the end of their life. The people that you’re talking about that don’t have any money are typically in a Medicaid home that pays a lot less right here in Colorado. It pays just under $2,700. So you’ve got to have pretty good volume in that to make those numbers work. You know, if you’ve got 20 to 30 in a facility, then those numbers work okay, but for these homes that you’re converting, you definitely want private pay. That’s where the numbers work. Jack: Okay. So now I’m pretty sure somebody is going to listen to that and is like, “Vern, by charging people so much, you’re ripping off people.” Now, I don’t agree with that, but I’m sure somebody is like, “You’re taking like the last dollar from these older ladies.” Just for the record, what do the large operators of private pay, what do they charge? Vern: So this is gonna blow your mind. There are some really nice ones here in the Denver Metro area and to get into one of those, some of these charge a fee just to get in of anywhere from $200,000 to $400,000. And then on top of that, they’re charging $6,000 to $7,000 a month. And then on top of that, if you need something extra, if you need help toileting, if you need diapers, if you need this, whatever you need on top of that, they charge on top of that à la carte. So you could spend $8,000, $9,000, $10,000 a month in one of those large facilities. Jack: It’s like joining a country club. Vern: Yeah, right. And you know what? They’re nice and they’ve got a lot of goodies thrown. Most of these people spend their time in their rooms. They don’t get out much. They do a little bit of activities, but they are not out using the fitness center, the pool, and all that stuff. Not at this point in time. If they’re younger then there may be an adult community, 55 or plus, enjoying those activities. But when they hit their ’80s, they really slow down. They’re not that active. And the care that they need ends up costing them a lot. So these small homes do two things. One, they are a lot less expensive. Two, the personal care that they get is tremendous. And if you’re bringing your mom into one of these, when you walk into these houses, it feels like a home. And you feel a lot better leaving mom in a home than you do…I don’t want to call it an institution, but you know, it’s a big facility and it has that feel to it even if it is nice. Jack: And I agree with you and that’s just for those who just like, the first time hearing that, they hear the number, $4200 a month, it blows their mind. It’s really literally just in the middle of the market. But what you offer is really comparable to the top of the market. And some of these houses might have pools. They might have fenced pools. Some of these houses might have a nice garden for people to sit out, right, in a covered patio and they have all these things that they can use just on a smaller scale and much more community and much more care from the end-of the-road caretaker because they don’t have to run around and take care of 150. They take care of only 9 or 10. Jack: Absolutely. So I love it. I love the idea. I love the concept. I love the scale. I love it. It’s very interesting that there’s this space in between and I’m always naturally interested in those, kind of, things. Like one of the houses we own right now…I just had a conversation about it. It’s in a rental area where we get the $1,000 for it as rent. And we are right now completely remodeling this house. But because it’s only one block from a private Christian University, we’re going to rent it by the room as a furniture luxury rental to the tenants. So we’ve taken everything out. We put good granite countertops and granite kitchen and stainless steel appliances and all this kind of stuff in there. Put nice recliners and furniture and the big screen TVs and everything on that thing. And then because of that, we can now charge $800 a room, right? Jack: And this is a $150,000 house. And it’s five bedrooms. So instead of getting $1,000 rent from a family, we now are gonna be able to get $4,000 in rent over five rooms and we just pay for all utilities. So our net is gonna be anywhere between $2,500 and $3,000 for a house with barely a mortgage on it, right? As a matter of fact, we own it free and clear. So your model is very similar to that. So that’s why it caught my attention when we talked when we met in Denver. We were both on a panel of a real estate event. I was the land guy and he was the assisted living guy. So afterwards, in the break, we didn’t have a whole lot to talk, but we had dinner. Afterwards, the host invited us for dinner. So we talked a little bit and I couldn’t wait to get you on the podcast because that is really…this feature, this tool that you’re doing is really, really cool. Are you still there? Okay. Well, it looks like we might have lost Vern, but, I think at this point I can also finish up the call because really, I wanted to just ask him a couple of more questions on basically what his outlook is on the market and so on. But it’s obviously, the outlook on the market, and I can tell that from the conversations that we’ve had, is that the United States, overall, even though we have immigration, we have people that have kids and the population is growing, it’s also aging. So as the population is aging, nursing homes, not nursing homes, assisted living facilities, which is different from a nursing home, assisted living facilities are actually growing. That’s why a lot of the big players, the guys that go and buy a lot of commercial properties and buy the $40 million place, and so on, the $40 million properties, they’re shifting. They have been shifting their outlook for several years on to assisted living. Now you and I or you might not be able to play in the $40 million space yet and I don’t play in that space either. If I do multifamily, I do regular multifamily in the $4 and the $3, let’s say $3 to $15 million range, but the big guys are really focusing on that area. But there is a space for the small investor to play and you’ve just heard the numbers. So with that, even though we lost Vern, I want to say thank you for your attention to this podcast. Again, if you enjoyed the show, put the comment below here on YouTube or go on iTunes and share this. Tell other people about it. We’re gonna have many more interviews just like that. And I absolutely love that idea, that concept. You can use it as a real estate player, or as a business player, or as a hybrid between the two of them. And it’s a beautiful way to help people and create a family environment for them and also have a very profitable endeavor. All right. With that, thank you very much. Looking forward to next time. Bye-bye. Announcer: Enjoyed this episode? Then make sure you like, subscribe, and post your comments and questions below the video. We’re looking forward to hearing from you.